There is no question that Google is the dominant force in advertising. By the end of 2017, the company accounted for more than 44 percent of global online ad revenues. However, not too far behind it was Facebook, which at the time accounted for 18 percent of global online ad revenues. Now, Facebook is looking to step up its game by taking a few pages from Google’s playbook. On Thursday, the company announced several new ways to buy and deliver video ad campaigns on Facebook with In-Stream Reserve and ThruPlay. Similar to Google Ad sense, which allows companies to advertise on the top 5 percent of YouTube videos, In-Stream Reserve, gives companies the option of only advertising on content from “the most engaging, highest quality publishers and creators.” Additionally, it allows advertisers to choose content packages in specific categories, including sports, fashion, and entertainment, as well as specific Facebook Watch shows. With ThruPlay, advertisers pay only for ads that are watched to completion, or for at least 15 seconds. The program is similar to that of Google’s, which only charges companies if viewers watch the full 30-second ad. ThruPlay is available for all video placements in Facebook and Instagram which includes in-stream, stories and feed. Both In-Stream Reserve and ThruPlay will be available to all advertisers globally in the coming weeks. The U.S. House Intelligence Committee on Thursday released more than 3,500 advertisements and posts spread by Russian trolls before and after the 2016 U.S. election. Below is a look at 10 of the most shocking examples that stood out from Congress’s reveal. Many posts pushed the narrative that Hillary Clinton would confiscate guns if she were elected President. This graphic meme painted cops as KKK members attacking a young black child. Only “sissies” and other undesirables wouldn’t support Donald Trump, many of the memes said. President Obama was a “pawn” and “traitor” in the hands of “Arabian Sheikhs,” said one 2016 ad. The “Black Matters US” page touched on hot button issues like police shootings. The “Army of Jesus” page shared a bible verse, along with this meme. 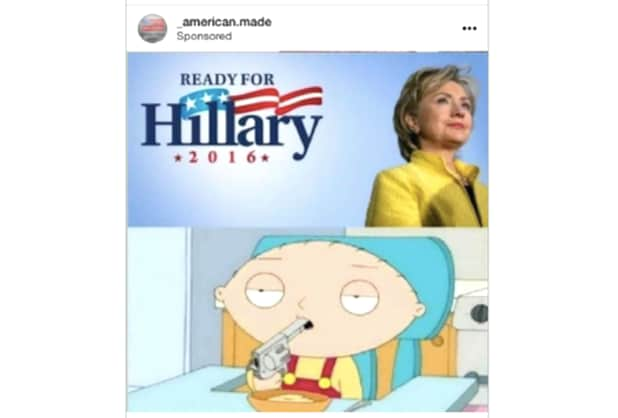 Russian trolls also used Instagram to spread sponsored political memes. The “Blacktivist” page routinely shared memes on Colin Kaepernick and other football players kneeling during the national anthem. “Heart of Texas” routinely posted on “Killary Rotten Clinton,” and threatened to secede from the union if she won the election.